We don't need to be told that the Lower Wye Valley is beautiful but particularly so in Spring when the bluebells are in full bloom. The festival offers the opportunity to discover more about the countryside and it's hidden heritage that we have in abundance. 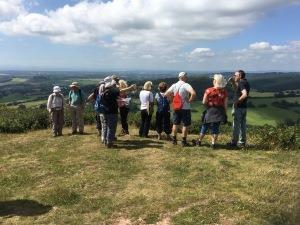 Some of the highlights include a walk around Caerwent with Dr Mark lewis Senior Curator at the Roman Legion Museum Caerelon, a visit to the producers of Brookes ice cream, the first stage of Offa's Dyke Path led by National Trail Officer Rob Dingle, an encounter with Llamas, a walk discovering the childhood haunts of J K Rowling and much much more. Visit the website for the full programme which will be available beginning February. Advisable to book early to guarantee your place as there are limited places. Under 16's free as is the Walk for Health.